What are Chemtrails? Are they real? For some reason, this debate rages on in spite of the abundance of public evidence to demonstrate a very real and definitive answer. 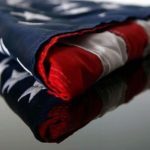 I addressed this briefly in RELOADED: An American Warning, but every once in a while, debates still spring up on social media over this topic. And still, there are always questions when people stare up in the sky and see clouds form, and remain, long after a plane has passed. 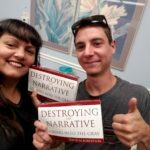 Recently, I was asked if I would be willing to write an article on the topic so I could provide a different perspective to the debate. So, are these lines in the sky simply contrails or are these really chemical trails? Let’s see if I can help clear this up. Contrails form when hot humid air from jet exhaust mixes with environmental air of low vapor pressure and low temperature. Vapor pressure is just a fancy term for the amount of pressure that is exerted by water vapor itself (as opposed to atmospheric, or barometric, pressure which is due to the weight of the entire atmosphere above you). The mixing occurs directly behind the plane due to the turbulence generated by the engine. If condensation (conversion from a gas to a liquid) occurs, then a contrail becomes visible. Since air temperatures at these high atmospheric levels are very cold (generally colder than -40 F), only a small amount of liquid is necessary for condensation to occur. Water is a normal byproduct of combustion in engines. Some people get worried because of how long contrails hang around after the plane has move on. Numerous books on the subject suggest that contrails can last anywhere from less than a second, up to several hours though. It all depends on the atmospheric conditions and of course the altitude the plane is flying. The thing to remember is that contrails are basically clouds. In fact, when you consider the overall makeup, contrails are very similar to cirrus clouds. The question you need to ask yourself however… is how can contrails remain longer than a couple hours, in a sky that is cloudless or has few clouds in the first place. Also, why does it always seem to rain within a day or so of the sky being filled with these trails? Is there something else to consider? Is it conspiracy? What about those clouds with the pretty little rainbow in them? Is there something to those? The “CHEMtrail”? According to the “chemtrail conspiracy theory”, long-lasting trails left in the sky by high-flying aircraft are chemical or biological agents deliberately being sprayed for sinister purposes and remain undisclosed to the general public. To clarify; a “chemtrail” is a Chemical Trail. The answer to whether or not this a real thing is simple enough, but let’s define the question first. There are actually several questions you could ask yourself right now, but let’s start at the beginning: Are any aircraft really spraying anything like chemicals at high altitudes? Well, if you ask the experts, that answer is actually a resounding “yes” and the information to prove this is actually all over the place! 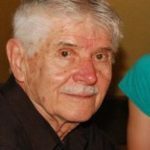 In fact, this practice is common place and is “well-entrenched across the West and Midwest” according to guys like Arlen Huggins, a scientist with the Desert Research Institute. So are the conspiracy theories true then? Well, sort of, but it really depends on how you want to look at it. As usual, it is not an “all or nothing” situation. Understand that this activity has been going on for along time already. The University of Michigan was writing about this as far back as 1970. But yes, it is true that airplanes over the West and Mid-west are spraying chemicals into the sky, but what we need to figure out is what are these planes spraying and why? 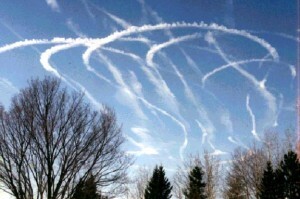 In order to find these answers, we have to first ask “what are they spraying?” Let’s get back to Arlen Huggins. Once again, he’s a scientist with DRI who has stated it is common place. But instead of asking him, let’s look at what he does and who he works for. Let’s explore the DRI website. The DRI Cloud Seeding Program is operated by the Division of Atmospheric Sciences, located in the Northern Nevada Science Center (NNSC), Reno, Nevada. The DRI cloud seeding program originated as an outgrowth of DRI weather modification research programs funded through USBR and NOAA. 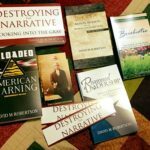 Picking up on a lot of critical keywords like “Atmospheric” and “weather modification” and “cloud seeding”, we can begin to explore other information sources. When you search out words like “weather modification”, you also see words like “Geo-engineering”. And when you search out “Geo-engineering”, you see the word “cloud seeding” once again. We are starting to close the circle here. These terms all seem to be related and things are starting to become a little more clear. Further research shows us that during the process of cloud seeding or weather modification or “Geo-engineering”, aircraft ranging in size from small prop planes to the large Boeing 747, attempt to bring rain to parched farmland by dispersing particles of silver iodide or solid carbon dioxide (or other elements) into rain-bearing clouds – at least according to sources like the Encyclopedia Britannica (if you trust them). Still, other academic sources suggest the same thing and say that silver iodide can be dropped or “seeded” into clouds to produce or increase rainfall. We are finally getting somewhere now! The terms seem confused, but things are adding up. In fact, we can easily research how states like California have recently turned to “cloud seeing” too due to their drought situation, using this very same technique. 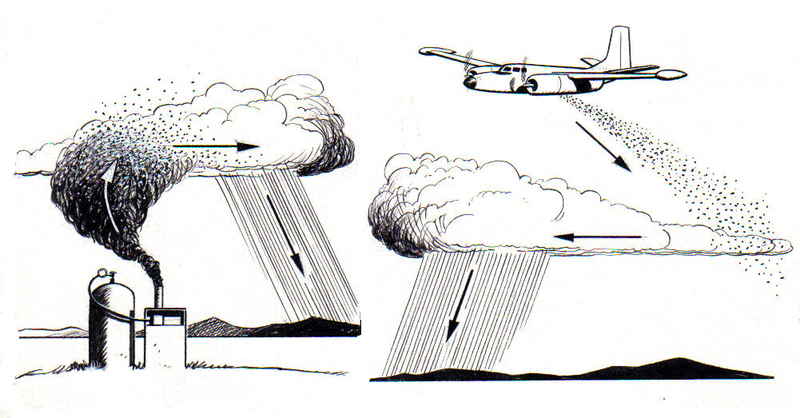 A drawing of how cloud seeding can be achieved. So planes are flying around, dumping chemicals like silver iodide into the sky? That sounds a lot like what the conspiracy theorists have been saying. Can this be real? Can they be right? 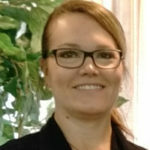 Amanda Zive of California State University reported that Silver iodide is the most common form of cloud seeding used today. 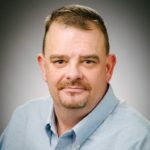 In fact, companies like North American Weather Consultants proudly display one of the many techniques to do it on their website. It should be noted though that “most common” also suggests that there are other methods or perhaps other chemicals as well. But this seems like a pretty good time to point out that quite a few people seem to know all about this. In fact, this is all very transparent so far. Nothing hidden and nothing sinister found as of yet. So perhaps the term “chemtrail” caught on because people didn’t know what else to call these trails or perhaps didn’t know what these groups were doing. So if everything is so open, surely these chemicals being dumped out of the planes are not hazardous right? Well, before we decide for sure, let’s revisit what the “conspiracy” is: that these long-lasting trails left in the sky by high-flying aircraft are chemical or biological agents deliberately sprayed for sinister purposes undisclosed to the general public. We now know that silver iodide is being deliberately sprayed, but are they for a sinister purpose? According to several sources, even the CIA helped fund a study by the National Academy of Sciences (NAS) that investigates whether humans could use Geo-engineering to stop climate change. However, this doesn’t point to anything sinister really and such actions are not just government directives. As mentioned earlier, universities across this nation seemed to be involved in it also and so are other nations around the globe. In fact, it was even reported that the Beijing Weather Modification Office spent a lot of time researching how to prevent rain in the city with similar methods during the Aug. 8 opening ceremony of the 2008 Summer Olympics. All this information seems to point to the attempt to stop or control climate or weather change and to increase or even decrease rain water. Sure, chemicals are being sprayed, but that doesn’t sound so sinister… minus the climate change debate of course, and ignoring how something like this could possibly be weaponized. So what’s the big deal? Perhaps we should address the chemical or biological issue itself. We read earlier that these planes were attempting to bring rain to parched farmland by dispersing particles of silver iodide. So what is silver iodide and is it harmful? This is where the story takes a turn. Yes, Silver Iodide is classified as a chemical. According to the chemical charts you can find all over the internet and in the chemistry books in your schools, etc., you will find that silver iodide acts as fungicide, an herbicide, and a microbiocide (Plant killer, bacteria killer, and fungus killer). Remember to hone in on keywords. However, the more we research this chemical, the more we see that it may not be so safe. It is well documented that the major hazards encountered in the use and handling of silver iodide stem from its toxicologic properties. Silver iodide is toxic by all routes (ie, inhalation, ingestion, and dermal contact). Being an herbicide means it will kill plants (crops) too. And according to the US National Library of Medicine and other peer reviewed materials, “exposure to this toxic, odorless, light yellow, crystalline substance usually occurs from its use in seeding clouds for rain-making, as a photosensitive agent in photography, as a local antiseptic, and as a chemical intermediate”. Wait!! What? So a toxic chemical is being dumped into rain clouds? What happens when these clouds release their water? Are we in danger? 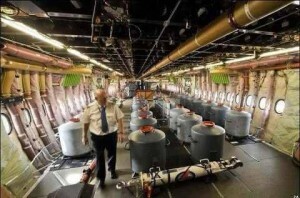 The inside of a large jet outfitted with ballast barrels? Great Question! According to the Handbook of the Toxicology of Metals, (2nd ed. Vols I, II. : Amsterdam: Elsevier Science Publishers B.V., 1986., p. V2 523) the emission of silver iodide crystals during cloud seeding has been estimated to result in a silver concentration in the air of about 0.1 ng/cu m. And again, silver iodide is toxic by inhalation, ingestion, and dermal contact. This means that it is hazardous to breath, hazardous to eat or drink, and hazardous on the skin. So if silver iodide remains in the air for us to breathe, or is rained down on our crops and skin, or is released into our water supply, what do you think that means? “Depends on the amount!” is often the retort. But consider this: people are still attempting to justify the use of Fluoride, even though the Lancet, (the world’s oldest and most prestigious medical journal), has classified it as a dangerous neurotoxin, on par with Arsenic, Lead, and Mercury. So take the “depends on the amount” argument for what it is. Are we starting to see the bigger picture? Still, in spite of the numerous outlets to prove this is a real issue, there are some who refuse to acknowledge it. They simply do not want to believe that anyone would engage in something that could potentially be hazardous to their health or their crops. And all of this in spite of the fact that there are companies that seem to be doing pretty well by making heavy metal resistant seeds and how the medical community is doing pretty well treating symptoms often associated with exposure. After all, effects from exposure to silver iodide include skin rashes, conjunctivitis, headache, fever, hypersensitivity, laryngitis, and bronchitis (etc.). 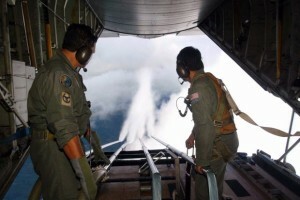 Each of the cloud seeding projects uses specially-equipped aircraft designed to place seeding materials (in the form of pyrotechnic devices, or flares, containing silver iodide and other compounds) into convective towers (turrets of growing thunderstorms) to induce them to expand and process more atmospheric water. The seeding is achieved by burning flares either mounted on the wings of single and twin-engine aircraft or held in racks, and dropped (ejected), from the underside of the aircraft fuselage. It’s not a conspiracy theory when no one is hiding it! So why is the public not aware of this? Because they refuse to read, look up into the sky, listen to reason, or take the time to research? It’s hard to say why they would deny something so obvious and prevalent. Of course, it is not exactly something the government or any other entity really advertises. But again, it’s not anything that is really being hidden either. 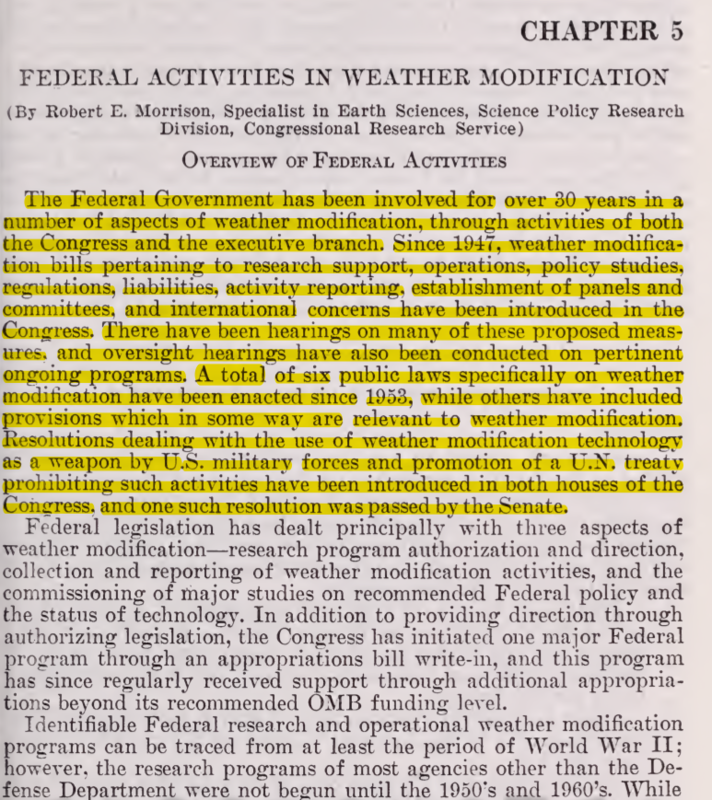 There are companies like Weather Modification Incorporated (and others) proactively trying to make a living doing it. So is this all a big deal? That is really for you to decide. Obviously, some people do not think it’s a big deal, because they refuse to even acknowledge the reality of it or engage in the practice of it. Others, take it to a whole new level as though THIS is what is going to cause the end of mankind. But somewhere in the middle, are those who have a legitimate concern about the long term effects of low dose exposure to these chemicals – as in: what are the long term effects on our crops and personal health in regard to exposure of these known toxic chemicals? Regardless, it should be very apparent now that the idea of “Chemtrails” is not exactly a “conspiracy theory” at all. It is simple: Cloud seeding = weather modification = Geo-engineering = Chem-trails – are are very real. We are literally surrounded by facts, diagrams, companies, government funding, etc. to demonstrate this. Just look at what nawcinc.com has to say about it. So feel free to call it a conspiracy theory if you wish. It does not make it any less real! As you can clearly see, chemicals are in fact, being dumped from aircraft, which means that the idea of “chemtrails” is very real. It seems that only what to call it is in dispute. The question then becomes “how much of this is going on?” That I do not know, but it is not hard to speculate. As we just learned, in Texas alone, they run hundreds of missions each season. Compound this by numerous states, or even globally, you can see that it adds up quickly. Of course, this is just what we know about. And no, this article doesn’t address other situations, experiments and/or elements such as the aluminum and barium being dropped, HAARP or even what is known as “chaff”, but now that you know that there is something to look at in the first place, perhaps now you can dig for the rest of the story. There is plenty to look at. Do some research for yourself. I’m just letting you know it’s real. Want an idea of where to start? You could always look up things like “stratospheric sulfate aerosols” or “solar radiation management“. Or maybe just look at any of the following… or just visit sites like EvergreenAviation.com and see that they provide supertankers for weather modification as a service. Pacific Standard: Geoengineering: A Dangerous Tool or Climate Control of the Future? Next Next post: Are You REALLY a Three Percenter?